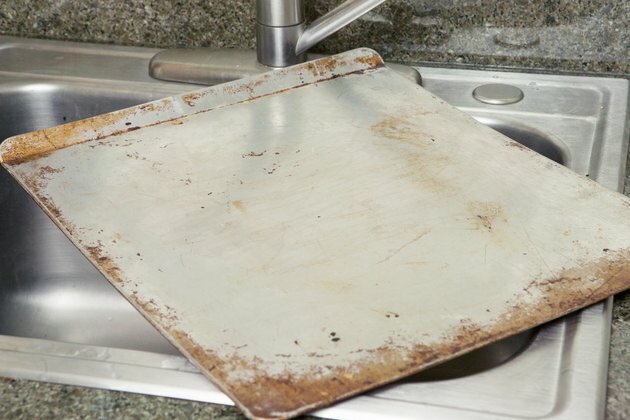 A cookie sheet can see a lot of wear and tear, especially around the holidays. It can commonly accumulate baked on cookie dough, crumbs, pie filling, cooking oil, and other types of food-related grime. 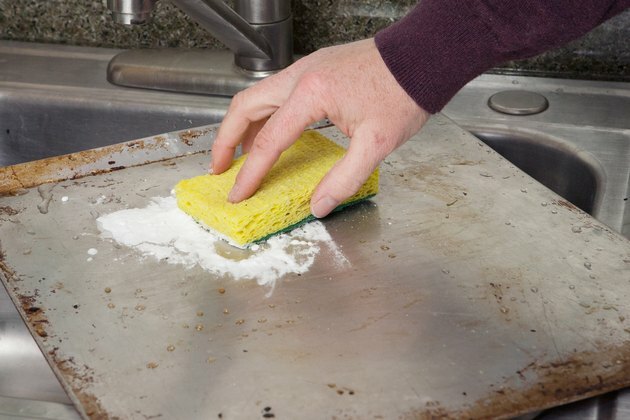 Scraping a cookie sheet with a copper scratcher, or using an abrasive cleanser, can scratch the surface. Not only that, but it can require a lot of arm work. There are a few easier and safer ways to clean a cookie sheet. 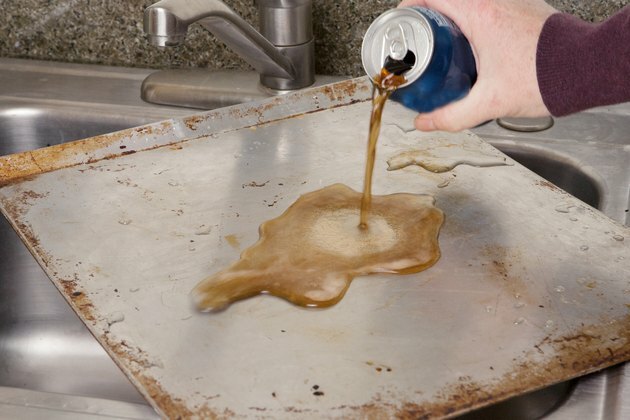 Pour cola soda on foods that are stuck on a cookie sheet. Let the cola soak 10 to 20 minutes, depending on the amount and stubbornness of the grime. The acid and carbonation in the cola soda will soften and release the grime, according to Home Furnish. Dump the cola soda. 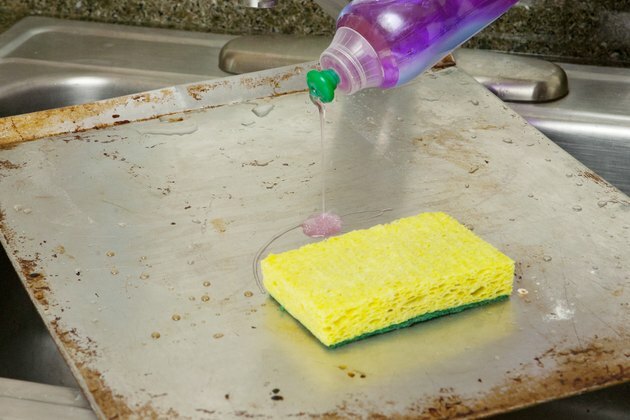 Wash the cookie sheet clean with dish washing liquid and a sponge or dishcloth. Use baking soda to clean a cookie sheet if it needs scrubbed, says the Ecology Center. Sprinkle a little baking soda on any stuck or burnt-on foods. Wet a sponge or a nylon scrubber with water. Then, scrub the cookie sheet clean. Place a few drops of dish-washing liquid on a sponge or dishcloth and wash the sheet all over. 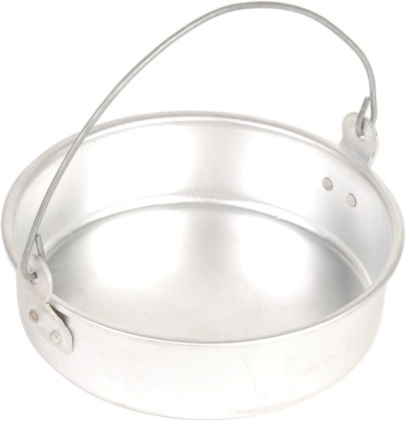 Clean a cookie sheet with vinegar and cream of tartar to remove cooking grease and grime. Add enough vinegar to 2 tablespoons of cream of tartar to make a thick paste, according to Vinegar Tips. Rub the paste on the grimy areas of the cookie sheet with a moist sponge. Allow it to dry. Then, wash the entire cookie sheet with dish-washing liquid on the sponge.